One of the best things about MLB The Show 17 is how well it replicates the real-life duel between pitcher and hitter. Every at-bat becomes an intense chess match where both parties are constantly trying to get in each other’s head to figure out what to expect next. Each pitch then represents another opportunity to stay one step ahead of your opponent and create a situation where you can grab the upper hand. Of course, the old adage in baseball is that good pitching beats good hitting, and with that in mind, we offer you a handy guide on how to get out the best of hitters and dominate while on the mound.. The first thing to consider even before taking on any hitters is which of the many camera views offered by MLB The Show you’d like to use while on the mound. Some people prefer to stick with the same presentation they use while hitting, which usually means employing one of a handful of angles from behind the batter. Others prefer to go with the something more in line with what you would see from a TV broadcast, meaning a view from behind the pitcher. There’s not really any discernible advantage or disadvantage to be found from any of these. It really comes down to what you’re most comfortable with, and it may take some time playing on each of them to find what suits you best. Just as with camera views, choosing which of the four pitching interfaces to use will ultimately come down to individual preference, but there are some pros and cons to bear in mind with each. The oldest and most commonly used option is meter pitching, which utilizes a simple risk and reward timing engine. You start the meter in motion and then can choose whether to be cautious by releasing it when it’s reached somewhere in the realm of the yellow, or if you’re feeling more aggressive you can allow it to delve all the way into the red at the end of the meter. The idea here is that the further down the meter you release the button, the more effective the pitch can be but the less margin for error you have (and the more of your pitcher’s stamina will use) when it comes time to try and locate your pitch by pressing the button again in the small white area (which will get bigger if your pitcher is thriving). Accordingly, you may strategically want to be a little more daring with this engine when you’re ahead in the count, and play it safer when you’ve fallen behind and really need to throw a strike. Classic pitching removes almost any human influence and relies almost entirely on the abilities of your pitcher. You still select a pitch and a location, but whether or not you hit that spot is completely determined by the skills of the pitcher you have on the mound. While this means you don’t have to worry about making any mistakes, it also removes some of the fun of having control over your pitches. Pulse pitching is sort of similar to classic pitching in that it relies a little more on the abilities of your pitcher, but offers slightly more influence for the user than classic. This engine will force you to try and time your pitch to when the pulse cursor is the smallest for maximum efficiency at the risk of missing your spot if your timing is off. Analog pitching allows you to use the right stick alone to influence the effectiveness and control of your pitches. You simply pull down on the right stick to start the wind-up and then back up again once the cursor has reached the yellow line. 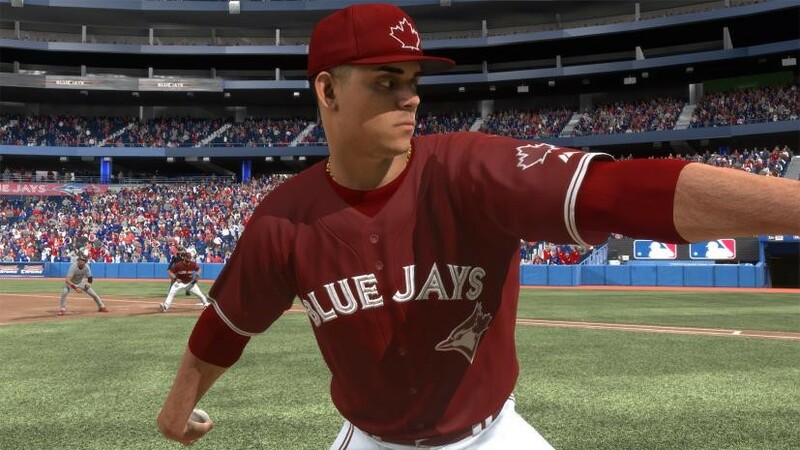 The trouble here is that it can take some practice to pull up on the analog stick at the ideal angle to hit your spots — especially at the corners — but once you get the hang of it, it does offer more control over where your pitch will end up without having to worry as much about your pitcher’s abilities. Once you’ve selected your camera view and interface, it’s time to actually learn how to use your pitches to keep hitters from obliterating the ball. Naturally, every pitcher is a little different, so it’s important to first familiarize yourself with the strengths of whoever is on the hill. Your pitcher may have as many as five pitches to choose from, but it’s worth noting that the pitches are typically placed in order of how often they’re habitually utilized by the pitcher and also how effective they are with that pitch. Though it obviously varies by pitcher, you usually want to be throwing your pitcher’s one or two best pitches the majority of the time while using the other pitches to complement them. Bear in mind that your fifth pitch is by and large going to be your weakest one, so make sure to only use this sparingly, as it’s likely to be hit pretty hard if squared up well by the batter. The most important thing to remember is that the fundamentals of pitching are about mixing speeds and locations, while trying to throw what the hitters are expecting the least to ensure that they’re never quite comfortable at the plate. It helps to get ahead in the count, as it will then allow you to expand the strike zone and increase the likelihood that you can get a batter to swing at a pitch out of the zone, which will in turn usually induce either a swing and a miss or the kind of light contact that’s more conducive to getting outs. While you may find when playing against the computer that it is generally pretty balanced in hitting pitches no matter what you throw or where you throw it, the same is certainly not as true when playing against live opponents. Part of the fun of playing against other people is learning what they are good at hitting and, more importantly, where they struggle. It may take you an inning or two to build a scouting report, but you’ll usually begin to notice trends in what kind of pitches and locations people are struggling to handle. For instance, the most common issue that you will encounter when you start playing people online is that a lot of them are prepared to swing at pretty much anything. If people are willing to get themselves out by swinging at bad pitches, there’s nothing wrong with exploiting this deficiency and not giving them a lot of good pitches to hit until they develop a better eye. You’ll also find that there are players who might be especially adept at hitting fastballs but they are way out in front of anything off-speed (or vice versa). If that’s the case, simply feed them a steady diet of breaking balls and you’ll take away their greatest strength and, in all likelihood, hold them to very little offense. – While it’s good to keep batters on their toes by spotting your fastball in all sorts of different locations (people online seem to especially struggle with the high ones), it’s generally smart to keep your breaking balls down in the zone. When you miss your spots and start elevating these, you can often find yourself getting lit up. – Avoid, whenever possible, throwing curveballs in the dirt or sliders way outside the strike zone with runners on base, especially on third. Catchers aren’t the greatest at blocking pitches in the game and you’ll concede a base or even a run thanks to a passed ball or wild pitch if you’re not careful. – A cutter can be an effective pitch to run in on the hands of a batter or nip the outside corner, but try not to throw too many cutters that start inside and then drift back over the plate as hitters will often see these pitches well and, all too often, knock them out of the park. – Trust your instincts. You can sometimes select a pitch a little too quickly in the heat of an at-bat and then get a funny feeling that it might actually be the wrong one to throw in the situation. Don’t be afraid to then step off the rubber, take a breath and pick another pitch to throw. – Know when it’s time to give your pitcher the hook. It’s easy enough to tell a pitcher doesn’t have it when he’s giving up run after run, but it’s more important than ever this year to keep an eye on your pitcher’s stamina, especially with relievers. Gone are the days when you could push a pitcher past his limits with little consequence, as he will now start to miss the zone or serve up meatballs to hitters. – Be aware of who is on the basepaths. If you have a speedy runner at first and you see them taking an extra step towards second, you may want to give a cursory throw over to let them know you see what’s going on. It also can help to prevent stolen bases by using a slide step to the plate or a well-timed pitch out. – Try to stay out of patterns when pitching. If you keep following up a fastball with a slider or putting hitters away with a curveball, people online will catch on eventually. Sometimes, the best way to be unpredictable can be to throw the same pitch two, three or even four times in a row.